As a group of scribes, obviously we here at BOP prioritize the written word. However, when it comes to screenplays, it's much more than just dialogue that makes them work. For our list of top screenplays in the last year of film, many excelled because of that dialogue, but others were champions of plot, setting, theme and/or character. While there's a heavy overlap between this list and our Best Picture group – how could there not be? – several films jump around in order based on our preference for that element of the film. 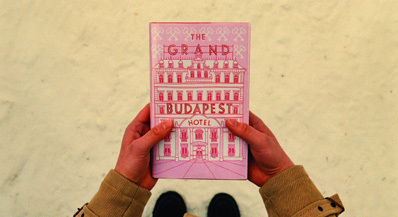 Our top honors then, go to The Grand Budapest Hotel (making the biggest jump of any film in the top 10) and its script by Wes Anderson, his first solo effort as a writer. Clearly he shouldn't have been dragging that dead weight around all these years, as this delightful farce and a paean to days of civility and service... which probably never really existed, but what the hell. In addition to Anderson's trademark rapid-fire and stylized dialogue, we're gifted with a well-lived in world with its own set of bizarre, yet eminently logical rules and customs, adhered to as a matter of honor, and which inform and drive the plot of the film in its own right. And speaking of the plot, it's a labyrinthine odyssey, structured like a Russian doll, which is always hiding one more layer or twist. The entire thing should have been completely ridiculous, but comes together as a marvelous tapestry of word play, spectacular characters and pure absurdity. Second place goes to what's turned out to be everyone's second favorite film of the year, Birdman, and its four writers. While its stylish direction gets a lot of attention, the film's script is also an amazing bit of characterization, of an actor looking to rediscover his own talents and show the world he's more than the shallow figure they make him out to be. It's also a clever meta-narrative on the nature of performance, and the relationship of an actor to his work and his audience. Add to that, Birdman also contains more than a handful of “wait, did... did that just happen?” moments that had us admiring the audacity of one of the year's best scripts. Third place goes to indie darling Whiplash, and its portrayal of a pas de deux between an aspiring jazz drummer and his domineering drill sergeant of a conductor. Playing almost as a straight-up thriller, Whiplash's script winds up the tension throughout, catching its lead character in an ever-shrinking trap of his psychological torturer's making, reaching a breaking point that we really should have seen coming. None of it would have been half as effective without the script's brilliant setup of its main duo, two opposing wills, one with a terrifying arsenal of abuse at the ready. We felt every moment of tension in this film thanks to its perfectly crafted story. Adapting a hugely popular book to the screen can often be a challenge, in that its big notes are often known by most of its audience. The translation can often turn into a “greatest hits” version of the book, sapping it of its energy and verve. However, Gillian Flynn adapted her own novel, Gone Girl, to the screen in a masterful fashion, and for which we've honored it with fourth place. The book's many twists survived to the screen with their impact intact, and elucidated what made this just an addicting story.